The dkNET Resource Reports provides a detailed overview of individual research resources along with citation metrics from the biomedical literature, community feedback and alerts, and information about who is using the resource. The Resource Name section includes the resource name, the RRID (Research Resource Identifier), and the proper citation of the resource allowing researchers to easily cite this resource in a paper or grant. What are RRIDs (Research Resource Identifiers)? RRIDs are are unique identifiers for research resources. 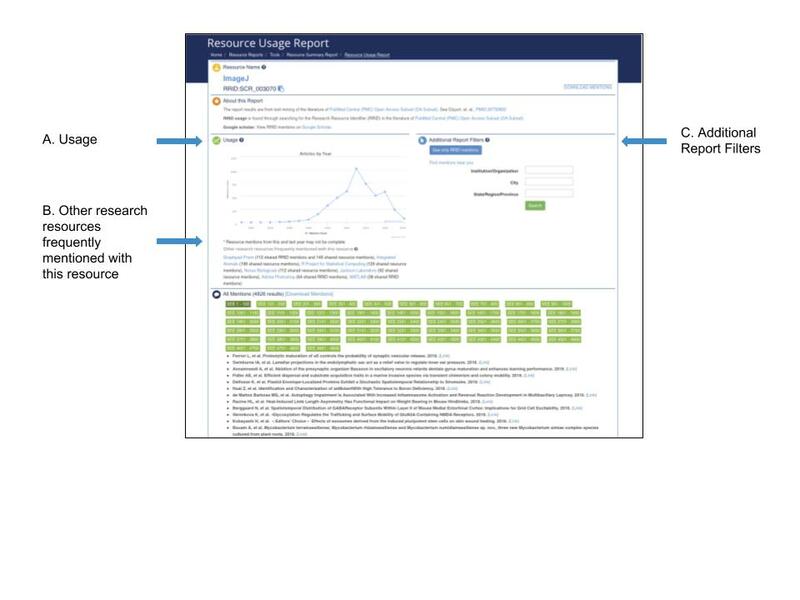 RRIDs provide uniformity in regards to the citation and tracking of resources, and have been adopted by many publishers and agencies involved in reproducibility in the scientific community. Tools: SciCrunch Registry (RRID:SCR_003115) is a curated repository of scientific resources with a focus on biomedical resources, including tools, databases, projects, repositories, organizations and more. Cell lines: Cellosaurus (RRID:SCR_013869) is an online knowledge resource of cell lines. Cellosaurus is the most complete curated cell line database, that also includes a list of contaminated cell lines updated from International Cell Line Authentication Committee (ICLAC). This continuously updated information allows users to be alerted of any problem with a cell line before planning experiments or before making conclusions. Antibodies: Antibody Registry (RRID:SCR_006397) is an authoritative source assigning unique and persistent identifiers to antibodies. It includes commercial antibodies and antibodies generated from individual labs. The Usage and Citation Metrics section provides researchers a simple way to explore citations of the use of this resource. Researchers can use this information to help them make a more information decision about using the resources in a study. The "View All" feature in this section provides a year distribution chart of articles, full list of articles, and additional filters. Currently, the citation information is updated automatically as the RRID-based text mining pipeline (see Table 1) finds new papers that cite this resource from the PubMed Central (PMC) Open Access Subset (OA Subset). As of November, 2018, there were over 2 million articles available in PMC Open Access Subset. The dkNET team is continuously working on expanding citation data from more publishers (see Table 2 for updated coverage), and the goal is to increase this number to 3 million articles by Summer 2019. While we are expanding our citation data, for your convenience, we have also created a link to help you to directly find articles that have mentioned RRIDs via Google Scholar. We normally update data in Usage and Citation Metrics section monthly. However, it may take 6 months or longer for PMC to have most recent published articles. What does dkNET search robot look for? Where does dkNET search robot look for in a paper? Please refer to here for a complete list of the journals currently covered. The Collaborator section provides a researcher search tool to find a list of researchers (name, institution, location) who have used the resource. Researchers can find collaborators near their location or at a specific institution or in a specific city or state. *This section is still a work in progress. We currently have good coverage for some locations such as Los Angeles, San Diego, and Boston areas, but not all areas are covered in Collaboration Network yet. 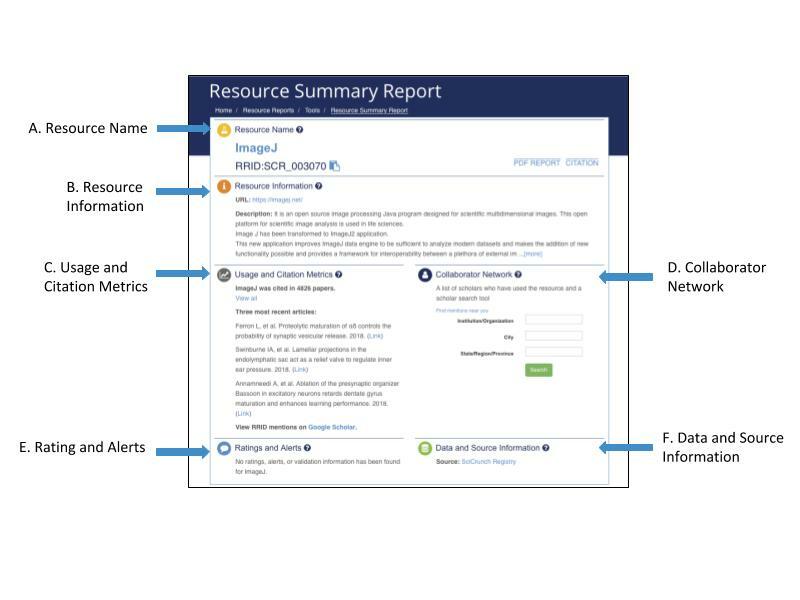 The Ratings and Alerts section provides researchers information on the resource rating, validation, and alerts of problematic resources when available. NeuroImaging Tools and Resources Collaboratory (NITRC): NITRC has software resources with rating information. Encyclopedia of DNA Elements (ENCODE): ENCODE has antibody validation information. Intestinal Stem Cell Consortium (ISCC): ISCC has antibody rating and validation information. Human Protein Atlas: Human Protein Atlas has enhanced antibody validation data defined based on the recommendations from the International Working Group for Antibody Validation (IWGAV) published in Nature Methods in 2016 (Uhlen et al, 2016). The cell line alert data is aggregated from Cellosaurus (RRID:SCR_013869). Cellosaurus also includes a list of contaminated cell lines updated from International Cell Line Authentication Committee (ICLAC). Our data in Rating and Alerts information is normally updated weekly. The dkNET team is continuously working on expanding rating and alert data from other sources. If you have any source recommendations, please contact us at info@dknet.org. The Data and Source Information section provides the source of the aggregated resource information. Additionally, if the resource is a resource provider and has resources or data indexed at dkNET, the information is listed in this section. The Usage section provides researchers a chart for the number of articles that mentioned the resources each year. This section provides researchers the information about what other resources (the top 6) are frequently mentioned together with this resource. Researchers can find other resources that are used together with the resource or highly related to the resource. The number of publications represents how many times the resources have been co-mentioned. The Additional Report Filters section provides researchers filters such as RRID usage, Institution/Organization, City, State/Region/Province. Researchers can find articles with authors near their location or at a specific institution or in a specific city or state. In addition, researchers are able to list articles that contain a specific RRID mention of the resource.